In honor of Breast Cancer Awareness Month come join us to talk about how nutrition can play a role in cancer prevention. Learn which types of foods can have a crucial role in preventing and fighting breast cancer. Exercise tutorials will be provided as well as healthy snacks, drinks, and prizes. Bring your kids for some outdoor fun at the park while you educate yourselves into a good health!!!! My blog covers a variety of topics from nutrition to fitness tips. I have been on a 1 year hiatus because 1 year ago I was blessed with a beautiful baby girl. Taking care of a baby is a 24/7 job so that would explain why I have not had a chance to update my blog. I wanted to write a post about my experience with weight gain during pregnancy and weight loss post-baby. I want to share my tips and strategies to getting back to your pre-baby weight! Pregnancy can put a toll on any woman's body. In this pregnancy, which was my 3rd one, I planned to gain only between 30-35 pounds. So I continued to exercise up until the day I delivered! I exercised about 45 minutes/ 4 times a week. I included weight training as well as cardio. I started out pre-pregnancy weight of 110 and I ended at 145. Exactly 35 pound weight gain! I felt great after having the baby because I did not have much unwanted pounds to lose. Post-delivery I weighed in about 119. Now this number is not bad for me considering with my previous pregnancies I had gained over 50 pounds. I knew that with this pregnancy I had to be careful since I had 3 kids and losing weight would be a struggle. Would I find time for exercise? Would I be able to control stress eating? That is why I am glad I did not have much to work on. Even though I did not have much to lose it still took time. They say it takes you 9 months to gain it so it will take you 9 months to lose it. Boy were they right! I wanted to take my time and not stress my body out. I believe the key to postpartum weight loss is to start watching what you eat the day you have the baby. Do not go into your pregnancy eating habits!! Start watching refined carbs, desserts, portion sizes, cut out sodas, drink plenty of water,(especially if your breastfeeding), and for the first 6 weeks get plenty of rest. Rest is important because you do not want your cortisol (stress hormones) levels going up and causing weight gain in your belly area. So when your baby sleeps you sleep!!!! When your doctor gives you the go-ahead you can start exercising again. This will make you feel great despite all the sleepless nights and stress of a new baby. Make sure you are drinking plenty of water to stay hydrated. If you feel hungry you might not be! It might be thirst! Drink water!!! Include Green Tea with ginger-metabolism booster as well as belly bloat blaster! Try oatmeal for breakfast-include a protein and a fruit for a complete meal! If you worked out during pregnancy start slow then you can begin your normal workout routine pre-pregnancy. Do not weigh yourself in the beginning of your exercise regimen you tend to gain a little when you start then it starts coming off soon enough! I have given you some excellent pointers! Do not stress about the baby weight let it come off slowly because then it will stay off. We do not want those pounds to creep back on by going on crash/fad diets. Do it the right way through healthy eating and exercise! Good Luck ladies! Don't be afraid to add any comments or suggestions if you have any! COFFEE!!! What a great way to start the day!!! WRONG!!!! The best way to begin your day is to get moving. Don't think your body can get moving without caffeine? Think again! Once you hop on that treadmill, stepper, hit the pavement, or whatever form of exercise you choose your endorphin hormones will start kicking in. You will want to keep going because you feel so good. 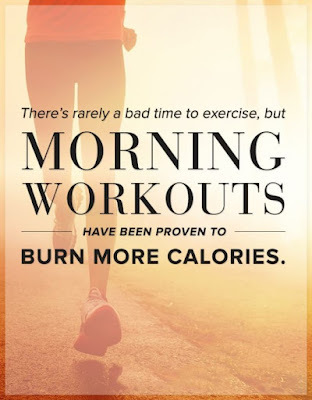 Studies have shown that exercising in the morning pre-breakfast can burn up to 20% more fat! 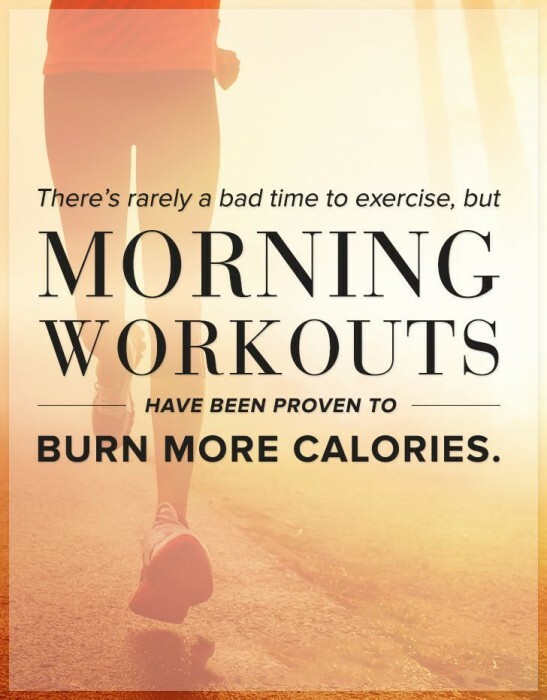 So try fitting that workout in before your breakfast meal. Remember after your workout to fuel your body with a breakfast that is full of good fats, protein, and a high fiber carbohydrate. Having a stack of pancakes loaded with syrup will set your weight loss efforts out the door! 1/ 2 cup rolled oats,(cooked in your choice of water or milk) nut butter, and a fruit of choice. 1/ 2 cup of rolled oats,(cooked in your choice of water or milk), fruit, and a hard boiled egg. For some caffeine forget the coffee and opt for some green tea with ginger and a dash of lemon. This will keep your metabolism going and also give you the little caffeine boost you might need. Need more caffeine during the day enjoy 2 or more cups of green tea throughout the day. Remember don't hit the snooze button! Get up and get moving! Your mind and body will thank you.